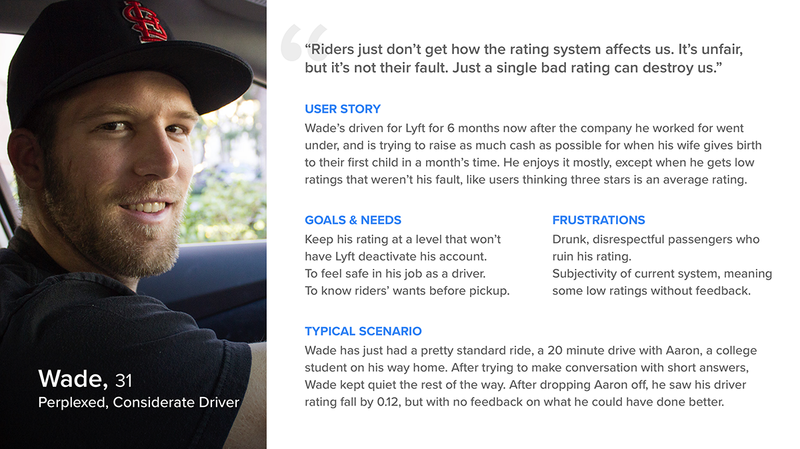 In a two week project, my team and I researched, conceptualized, and prototyped an alternative solution to the traditional five-star system currently used by passengers and drivers of the rideshare application Lyft, to rate one another after each journey. A quick introduction to the group. 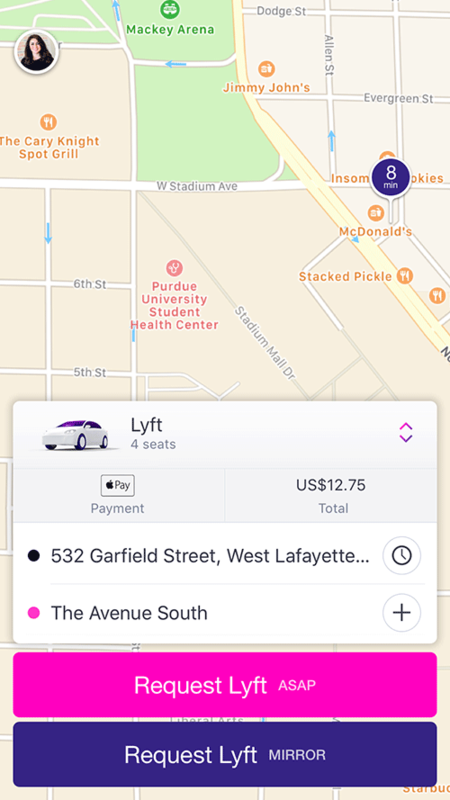 Lyft is one of the world’s largest transportation companies, facilitating over one million rides per day in up to 300 US cities, despite owning no fleet of vehicles. 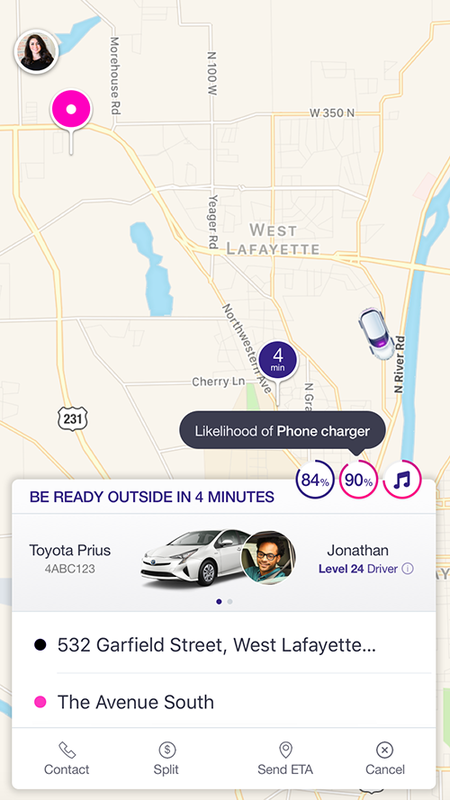 One of the most important aspects of Lyft’s service is the qualified and accurate ratings from users, although the current five-star system’s limitations tacitly encourage users to rank their driver using only very good or very bad rankings. Our goal was to create a replacement for the current rating system that Lyft uses, considering the ways various rating systems constrain the input of users, the ease of use in urban environments, and the ways in which this information could be used maliciously against drivers. The key stages of the team's approach. Personal contributions to the project. While I was involved to some degree in the majority of activities throughout the project process, there were certain elements that I took the lead on. 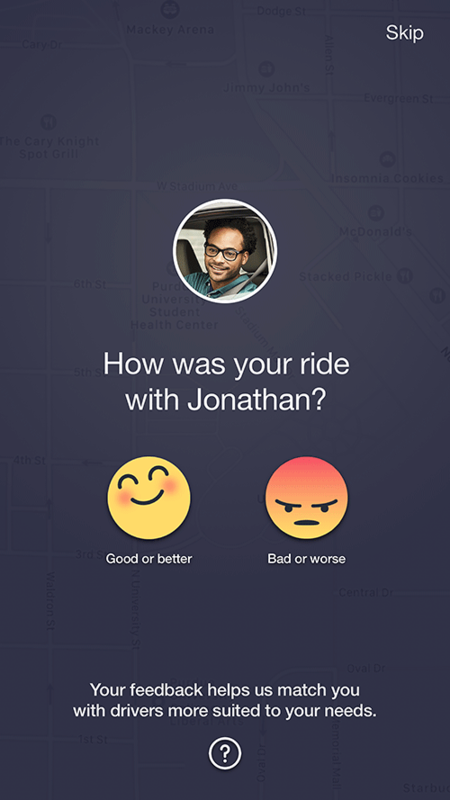 Conducted unstructured interviews with Lyft & Uber drivers during rides. 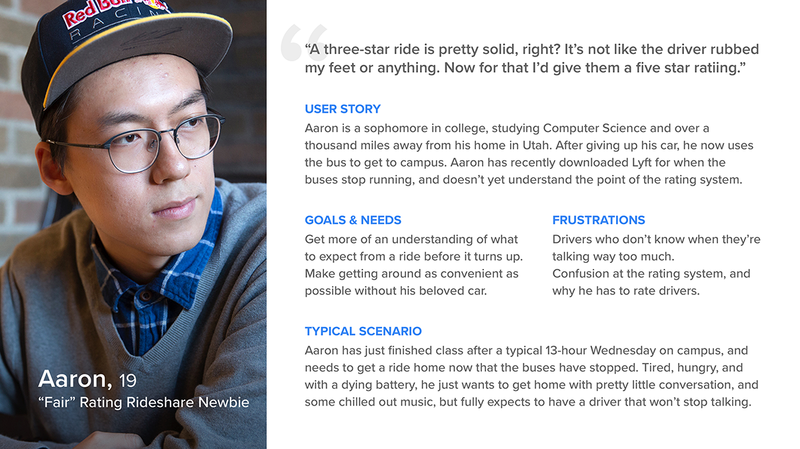 Created user personas and scenarios. Designed and refined low/mid-fidelity prototype UIs for testing purposes. Conducted two rounds of usability testing with paper prototypes, with eight participants. Designed proposed solution UI for final project presentation. Scoping the problem in question. Our initial secondary research consisted of gaining an overview of the issues with the current system, and rideshare environment in general for all Lyft stakeholders, with mediums studied including Twitter & Facebook through keyword and hashtag searches, academic and public reports as to the emotional invocations of a five-star system, and YouTube videos depicting drivers frustrated with the current system. We also identified other rating systems, evaluating their strengths and weaknesses in the contexts of some examples of their implementations. Evaluating the 5-star rating system, it's strengths and weaknesses. Alternative forms of rating systems, such as the thumbs up/down, and linear scales. Social media posts regarding positive and negative experiences using Lyft and Uber. 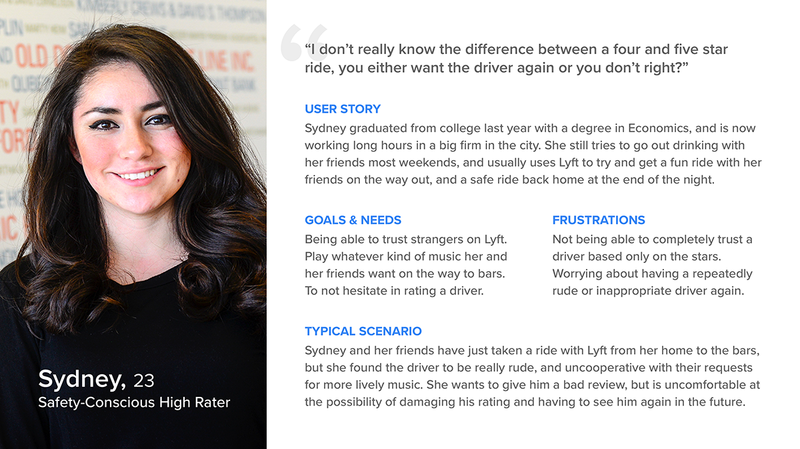 Using the findings of the initial secondary research, we conducted semi-structured interviews with 8 users of Lyft or Uber, to gather more information as to their rideshare usage behaviors, as well as their rating habits and understanding of the system currently in place. I also took two separate rides with a driver for Lyft, and then a driver for Uber, engaging in unstructured, free-flowing conversation to gain their perspective on the five-star rating system incorporated by both companies, and also to gain some understanding of how Lyft works, being an avid Uber user myself. "I've never given anything below a 5 star rating. I mean if the ride isn't terrible, why would I give less than 5 stars?" "I rate after every ride, but I really don't see the point. I don't know what a 2,3, or 4 star ride would look like?" "One bad rating, basically anything other than 5 stars, can put me at risk of Lyft deactivating me as a driver." I've never given anything below a 5 star rating. I mean if the ride isn't terrible, why would I give less than 5 stars? I rate after every ride, but I really don't see the point. I don't know what a 2,3, or 4 star ride would look like? One bad rating, basically anything other than 5 stars, can put me at risk of Lyft deactiviting me as a driver. With our core research phase complete, the team conducted an affinity diagramming session. Each team member sifted through all of the research carried out to date, and for around 30 minutes wrote down each separate point raised on to it’s own sticky note, dispersing all of the sticky notes randomly on a whiteboard. The team then worked together to group all of the sticky notes created in to associative groups, in order to identify key and reoccurring patterns and trends, in terms of problems found, user attitudes aswell as behaviors, and strengths of alternative rating systems used in other applications. The trends and patterns presented in the affinity diagram allowed us to identify the dominant problems caused by the current system, that would outline the focus of our succeeding research and design process. A "good ride" is completely subjective, with most users only rating 1 or 5 stars, causing innacurate ratings for a variety of reasons. The current system places too much pressure on drivers. Anything below a 5 star rating can severely damage a driver's rating. Many users are not currently compelled to rate their drivers, deeming it to have little or no effect on their future experience. The star system does not allow users to quickly and accurately recall and distinguish their ride quality through a rating. Personifying real user frustrations and needs. Based on the findings of the secondary and primary research so far, we were able to create three user personas to accurately represent the needs required to be addressed in the ideation and design of a solution, incorporating two representational passengers and a driver. Moving in to the design phase of the project, each team member went away to individually conceptualize and sketch some ideas for solutions to the problems raised throughout the research phase. As a team, we then discussed each other’s proposals, identifying the promising qualities that could be taken forward from each design. After collaborating to sketch out a solution based on the qualities identified, I then used Sketch to create a digital version of the design, which we then critiqued as a team to identify aspects of the design to be fixed prior to our first round of testing with users. Scenario-based testing, informing design iterations. It was at this stage that the team decided to move in a slightly different direction and extend the scope of the project, to create a system that would directly allow users to tailor their ride taken through pre-selecting preferences, and a driver being found who would ideally closely match those preferences. Taking these design changes in to account in the design iteration, we conducted our first round of testing with users. Using a paper prototype, each of the four participants recruited were given the scenario of a user who had just had a ride that matched some of the preferences selected, but was not necessarily fantastic or terrible. With one facilitator giving the scenario, and then acting as the ‘computer’ manipulating the paper prototype dependent on user actions, we were able to gain valuable insights through observations, and asking the participant to incorporate a think-aloud protocol, but only requesting free-flowing thoughts as to not increase cognitive load. With the findings of the previous round of testing analyzed and addressed in another design iteration of a higher fidelity, the team incorporated the same method in the second round of testing. 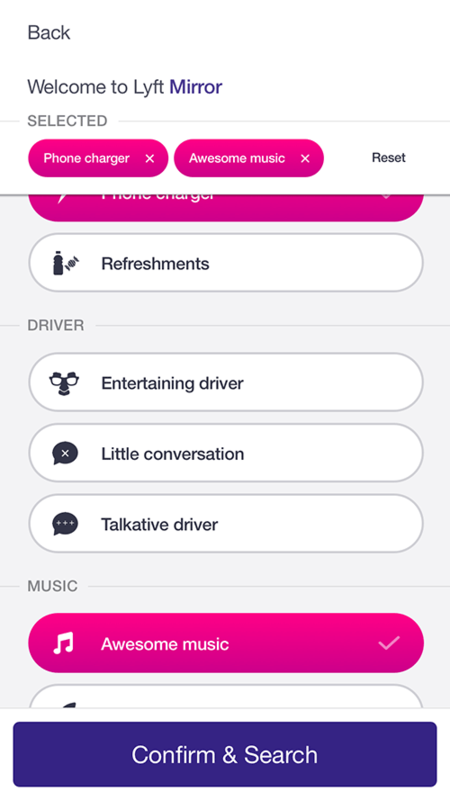 However, the changes to the design introduced a number of new screens that walked the user through the initial onboarding and preference selection process, as well as searching for a ride and being matched with a driver, with the hope that the rating process would be better understood with this added context. Again, four participants unfamiliar to the project were recruited, and through testing the team found that the new process walking the participant through the preference selection and ride search process, appeared to eliminate much of the confusion shown in previous testing during the rating process. A beneficial, accurate, and fair rating system. With the constraints placed upon the project in terms of time with the ever looming deadline for the class project, some minor modifications were made to the design based on the feedback given in the second round of testing. 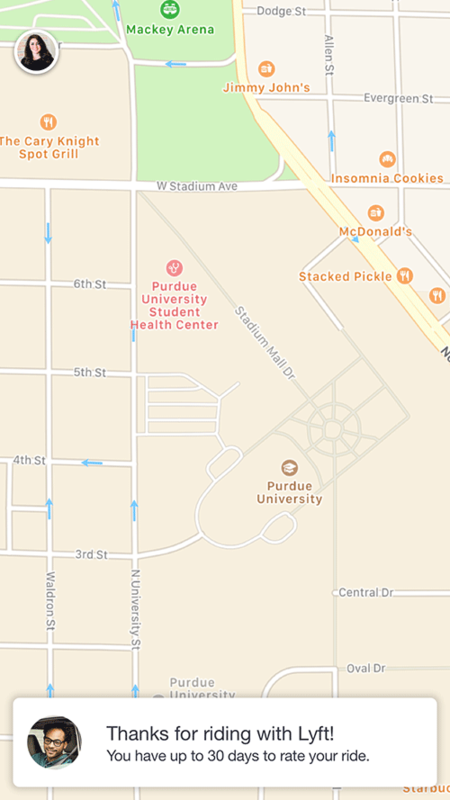 Once the user has set their pickup location and destination, they will be presented with the option to search for a Lyft ASAP (the current search method), or the proposed Lyft Mirror method. 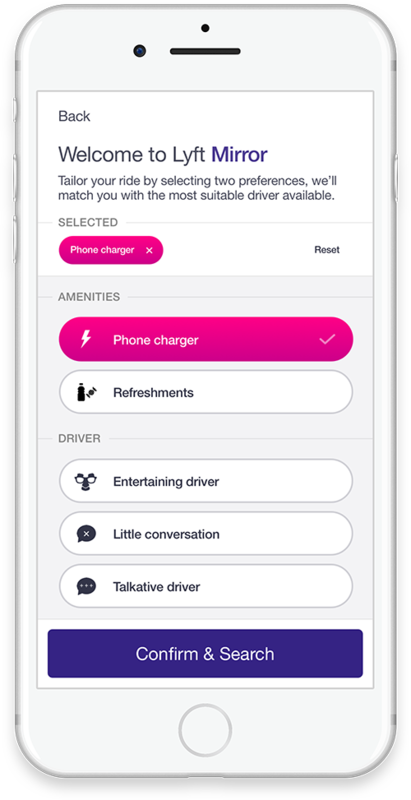 First time users of this option will be taken through the onboarding process, selecting up to two preferences they wish for their ride to meet, covering a range of categories from conversation level and music, to amenities available during the trip. 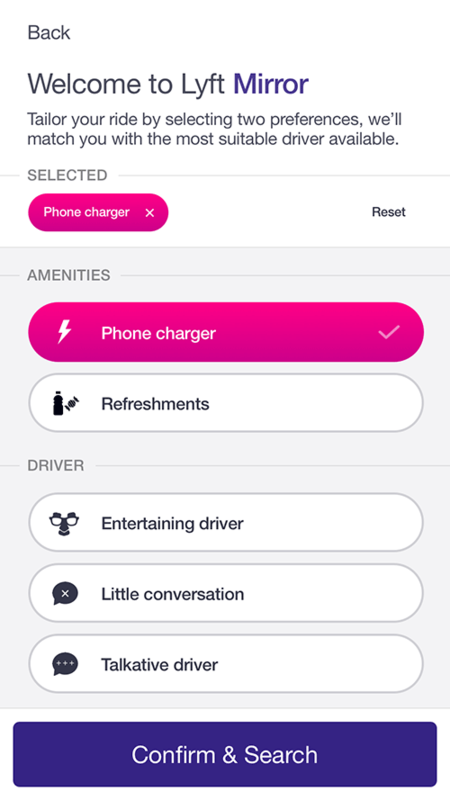 These options allow the user to tailor their ride dependent on their mood, or the situation, whether heading home after an exhaustingly long day, or heading to the bars with friends. These preferences are saved to the users account, but they can temporarily change the preferences for each ride, or change them within their account to be saved. 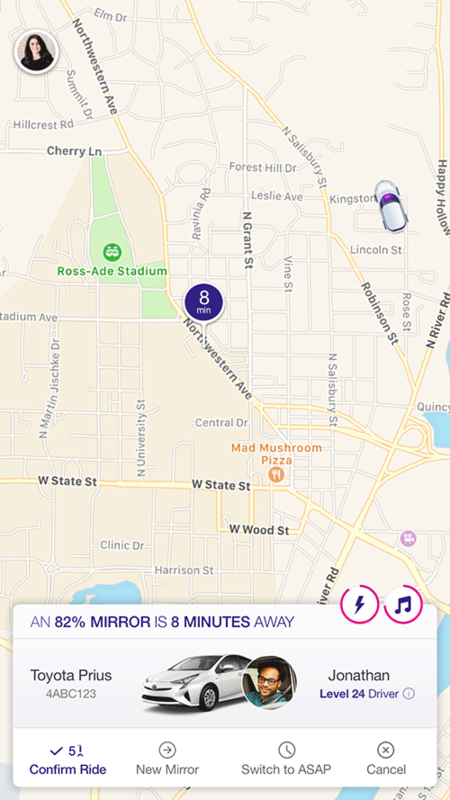 After using Lyft Mirror to search for a ride closely matching the preferences selected, the system will search the local surroundings to find the driver most closely matching those preferences. Naturally, this may not be the closest rider available, so if in a rush, the user may at this time switch to instead search for a close driver, or instead move to the next match. The user is given 60 seconds to confirm the match, after which the request will be cancelled. It is worth noting at this time, that the star rating applied to drivers has been replaced with a level-up concept. A positive ride will award the driver 1 point, while a negative ride will take away 3 points, with more points being required by the driver to progress up each level. This positive or negative rating concept will become clearer in the next section. Upon the completion of a ride, the user is no longer asked to provide a potentially inaccurate, and unrepresentative verdict of their experience. Instead they now simply have to match their emotion to the vastly differing visual options available, becoming more of a recognized visceral reaction rather than a recalled calculative effort. If positive, the user proceeds to recognizing and selecting the positive aspects of their ride (the selections in both positive and negative sections help to build up the profile of the driver, influencing the match system). It’s worth noting that if a driver matched based on a preference being over a certain level in their own match system, say 75%, then that preference will be initially selected, but can be deselected by the user. 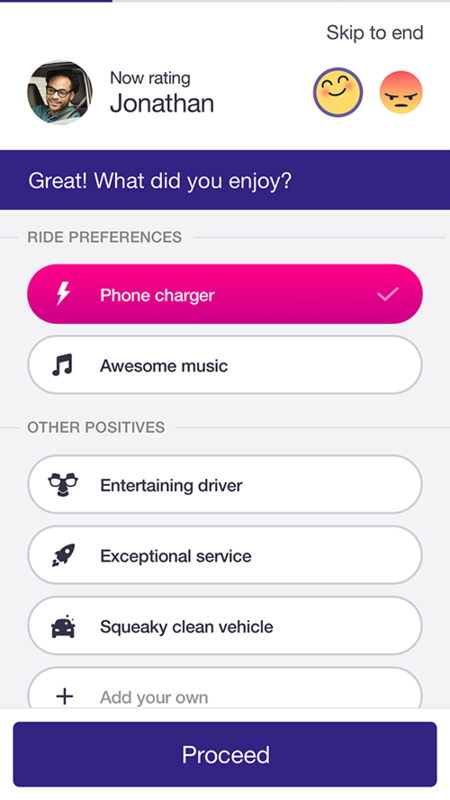 Even if the ride was deemed positive by the user, it doesn’t mean that everything is perfect, and every piece of feedback is valuable to both the driver for performance improvement, and Lyft as a company. 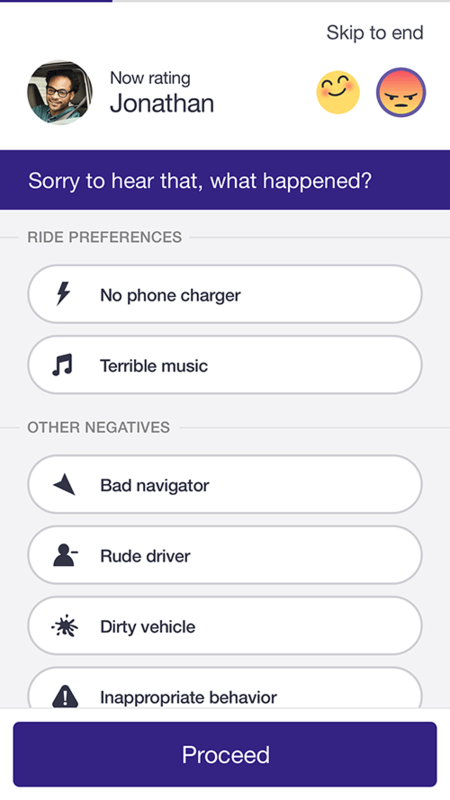 This means that users can now acknowledge any negative aspects of the ride, but without putting the driver at risk of deactivation through a less than perfect rating. The user is also able to add their own critique, if not available in the predefined list. 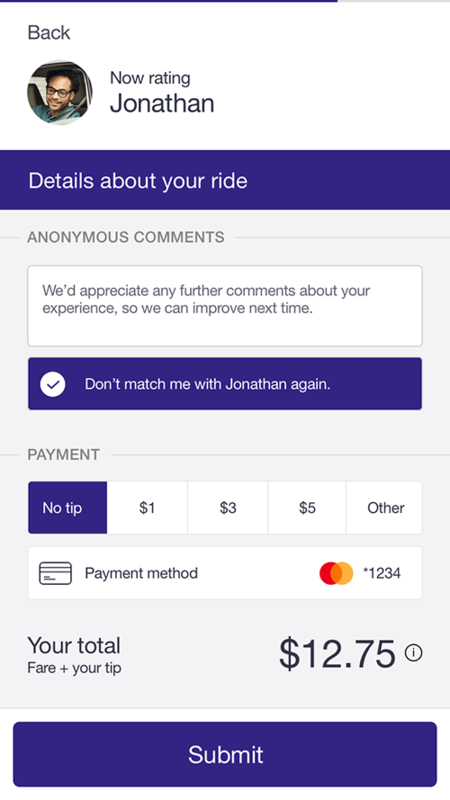 The process of leaving a negative rating for a ride works much in the same way as when leaving a positive rating, but with some key differences. 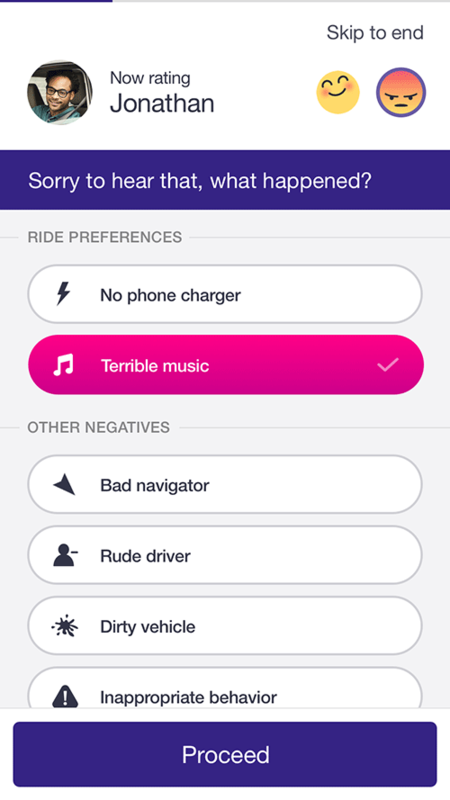 Firstly, the list of potentially negative aspects of the ride to select are requested from the user first, to allow for the recognition that the company is prioritizing their emotions and understanding what made their experience negative. When proceeding to the potentially positive aspects of the ride, the system is dynamic in the sense that the options displayed in this second stage depend greatly on those selected in the first. For example, if the user selects ‘dirty vehicle’ in the negative section, the option of the vehicle being ‘squeaky clean’ will obviously not be available to define as a positive aspect. 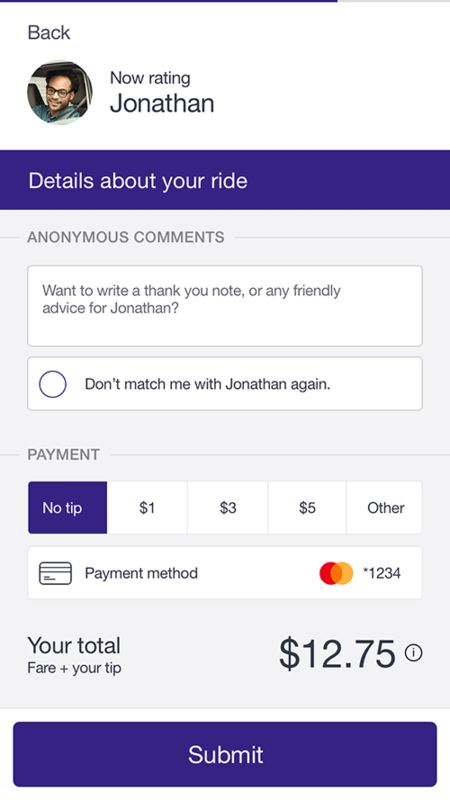 The user is also able to give additional comments in the final stage of the rating process, and in order to address the issue where riders would be afraid to give negative ratings out of the fear of matching with that driver again in the future, the user now has the option to ‘block’ a driver, meaning they cannot match with that driver again. The user would of course be able to unblock any drivers within their settings. The user can of course skip this rating once the process has been initiated. This option will take the user straight to the additional comments, tip, and payment screen. Once submitted, the user will have 30 days to go in to their account and review their ride in greater detail if they wish. To give the driver the benefit of the doubt, if no rating is given in this time, the rating will count as a positive rating for that driver. If in a great rush, the user still has the opportunity to skip the rating entirely and continue using the application. 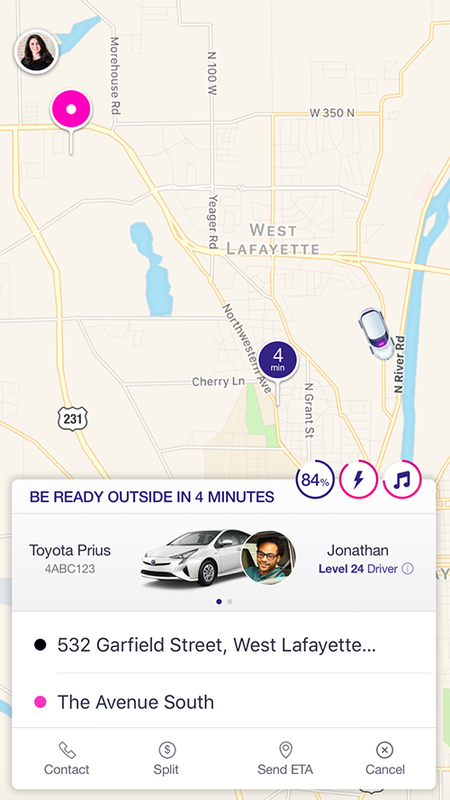 Just as with the process explained above, should the user not return and complete the rating within 30 days as Lyft currently allows, then the rating will again count as a positive rating for that driver. Applying visual and interaction design principles to redesign a single screen within Google Drive. Get in touch. Send an email.